$125.00 USD 9.5 x 10.5 inches Hardbound. NOTE: For purchases requiring overseas shipping, e-mail for a price quote. “William Neill is one of America's leading fine art landscape photographers. I personally find his work to be some of the most compelling that I have seen. His 1997 book Landscapes of the Spirit is an important and beautiful work, but unfortunately has been out of print for years." "Like many photographers I enjoy viewing and learning from the work of others. About 10 years ago I came across Bill Neill's Landscapes of the Spirit, and knew that I had found the work of a kindred spirit… Over the years since I have frequently recommended this book to students and other photographers looking for inspiration." "A Great e-Book… This is really a bargain for seeing some wonderful nature photography that will inspire you both in terms of the photography and Bill’s sensitivity to the natural world"
"This book is a feast for your eyes." 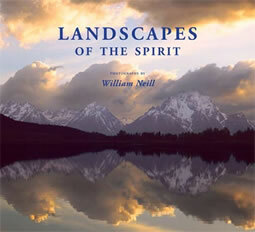 Thanks for your interest in my Landscapes of the Spirit book. I still have a few copies here even though the book has been out of print for a couple of years now. The dropdown menu below allows you to select Signature options. If you would like the book signed and personalized, please let me know to whom I should sign it using the Optional Instructions box when you use PayPal. I am very busy, so it may take a week or two after receiving your order to deliver the book. If the book is a gift, I will make every effort to meet your needs. If you have any more questions, please email me at wneill [at] sti.net. In this extraordinary collection of images from nearly 15 years of work, photographer William Neill reveals a clarity of vision and depth of emotional expression rare among landscape photographers. From within these 72 images--splendid vistas, intimate details of branch and moss, glimpses of order within nature's chaos--radiates a sense of serenity and peace, as well as an affirmation of the human spirit and its place within the natural world. "Seeing and feeling beauty is more vital to me than any resulting imagery," writes Neill in his introduction, describing the personal journey that impelled him toward a life in photography. Considering not only light and composition, but emotion, to be essential ingredients of successful images, he seeks the artistic and spiritual truth that emerges from his subjects. This dazzling collection of photographs displays the full range of light and shadow, grandeur and detail, and intimacy and mystery allowed by camera, film, and ink on paper. Whether capturing Big Sur surf at twilight, the abstraction of lichen on a tree trunk in Maine, or an ephemeral spray of dogwood blossoms against a wintry Yosemite backdrop, Neill invites the viewer to contemplate scenes of immense beauty emotional renewal. Introducing each of the portfolios of images is a selection of texts by writers from Ralph Waldo Emerson and Rachel Carson to Wendell Berry, Annie Dillard, Terry Tempest Williams, and others. Echoing Neill's guiding philosophy, photographer Paul Caponigro writes, "Through this work it [is] possible, if only for brief moments, to sense the thread which holds all things together." With unfailing eloquence, each contributor underscores the significance of our vital, healing bond with nature. Filled with insights and essential truths, text and images together form a powerful testament to the restorative qualities of wild nature. Landscapes of the Spirit is a magnificent and powerful celebration of the beauty of nature and the unique vision of one of today's most talented photographers. At the back of my book, I have included a Photographic Notes section especially for photographers with technical info about the equipment I used, and individual notes about the creation of each image. Every photograph is annotated with a brief essay about the mood, location, weather conditions, lighting or artistic intent that I hope will help you better understand my creative process. Special Note: The PDFs have been created for onscreen viewing only. Printing of the book's pages is disabled in these PDFs. NOTE: If paying without a PayPal account, upon completion of your transaction, you will be directed to a "transaction details" page with a button like the one shown below. Be sure to click this button to return to the download page.